In the Pacific Northwest you can’t plan the weather, even within a single day. How do you handle laying sod when a cloudburst hits? 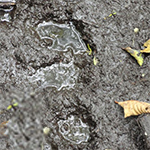 The worst damage comes from just walking back and forth and your footprints will create an uneven surface. The ground for your new lawn area needs to be prepared properly, graded smooth and compacted. The soil needs to be dry enough to work to create the proper base for your new lawn. More on how to prepare the ground for sodding. If rain arrives on the day of lawn installation, lay down sheets of plywood and this will prevent foot prints from being embedded in your prepared soil. The plywood spreads your weight much like a snowshoe allows you to walk on top of snow. You can also use plastic sheeting to keep rain off the pallets of sod waiting for installation. Take care not to walk on the freshly laid sod until the soil dries out a bit. You have to use good sense and realize there is no way to lay sod if the ground is a soupy mess. The plywood method works to protect an already flat and firm ground.